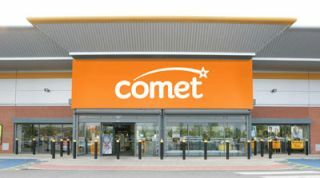 Comet owner confirms business is for sale, as Currys parent company reports huge loss | What Hi-Fi? It's not just Best Buy that's struggling in the current economic climate: electrical retailer Comet is up for sale, while Dixons Retail, the parent of Currys and PC World, has reported a huge loss (£224m pre-tax) after closing down its Spanish operations and reducing the value of both its Greek division and online retailer Pixmania. There have long been rumours that the loss-making Comet was to be sold by parent company Kesa, which also owns French chain Darty among other businesses. It's been suggested that Best Buy might be a potential buyer, enabling it to acquire a number of stores quickly, but that seems unlikely given the reports last week of the plight of the company with the Big Blue stores in the UK. Instead it's thought that most of the interest in Comet, which lost £9m in the last financial year on sales down almost 7%, is from financial operations. Kesa reported that 33 of its near-250 locations are technically lossmaking, with its larger stores among the worst performers, and that it hopes to sell the leases on over 20 stores to other retailers. A total of 17 stores "will be closed or exited, nine will be right-sized and seven will be retained and refurbished in the next three years". It's thought nine stores will close this year. Kesa management has said there is 'a range of strategic options to ensure the best overall value for shareholders', which are being explored while efforts are made to return the business to profitability. Newlands has said he will update the market 'within a matter of months', which suggests the clock is very much ticking for Comet.